About two years ago, when John and I went up to the mountains, we hauled both horses with us, and one cloudy afternoon I rode Prim. Sometimes I ride her across the paved road. It’s free-range country and I prayed we wouldn’t see a cow. We never did, but we did see quail. Lots of quail. Big deal, I thought. We have quail at home, and they’ve exploded under Prim’s feet before—but not on this dirt road, in these mountains. When she shied, her reaction was so sudden that when I went in for my usual feel-good massage, my therapist asked me if I’d been in a car accident. I said I hadn’t—and why had she asked? “Because you have whiplash,” she said. But this particular afternoon, I stayed on “our” side of the road. There’s a certain spot not far from our house where I usually let her run. It’s a straight dirt road with good footing, and it ends in an abrupt left-hand turn which makes Prim hesitate—which also makes it easier for her to “hear” my whoa signals. As soon as we reached the dirt road, I clucked to her and off we went, her long mane whipping my face. We were almost to the turn when something went horribly wrong. She pulled back, her stride ragged and uneven. I kicked my feet out of the stirrups and pushed myself away from the saddle so that I landed on the road. By now she had stopped, and when I slid the reins over her head and asked her to walk, she was three-legged—she would put her weight on every leg except her right hind. 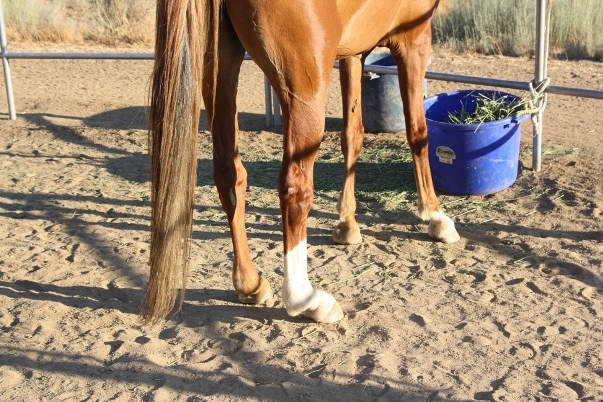 When she had to, she would put her weight on the toe—the only part of her hoof in contact with the ground. 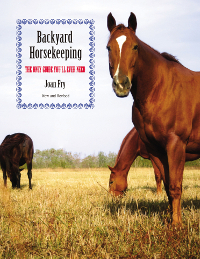 You’ll see horses in the field rest that way during lazy afternoons, swatting flies, half asleep, one hind leg cocked. That’s what she looked like. The difference was, she was moving. I knew immediately that I had to get her home. While we walked, I stroked her neck and talked to her. She seemed relaxed enough, not in pain. The sky had gotten darker, meanwhile, and while I didn’t see lightning, I did hear thunder in the distance. From time to time I glanced at her right hind leg. The longer we walked, the more weight she seemed willing to put on it. After about a quarter of a mile she was striding out at her usual impatient walk, and when it started to rain, I decided to keep my saddle dry and got on. She wasn’t lame—I couldn’t feel any hesitation in her stride. When we reached the corral, I immediately unsaddled her, rubbed her down, turned her out with Gunsmoke, and gave her a little alfalfa to make her feel better. Then I ran into the house and Googled dropped fetlocks. I had heard the phrase, although I wasn’t sure exactly what it meant. Most of the information I found that afternoon was from various forums and sites like yahoo.answers, which I don’t trust. The information can be out of date, and—worst of all—it’s a popularity contest. The people who post there vote on which answer they like best. I wanted to know what the experts had to say. 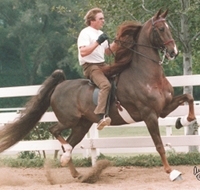 What was most helpful was seeing some photos, and what struck me immediately was that if the hind leg was involved, the horse’s leg looked almost straight viewed from the side. And yes, Prim’s right hind fetlock was closer to the ground than her left fetlock—especially when I compared her to Gunsmoke. As soon as we came back from the mountains, I called my vet, who confirmed that’s what it was. No real treatment, except to cut down on the alfalfa or replace it with a grass hay (so she wouldn’t have to carry as much weight on her bad leg), and give her a gram of bute a day. I could ride as long as I stuck close to home and only walked. The cure? There wasn’t one.